With my Grandma at her sister’s graveside. I’m in the middle of a week of church planting related travel that has me on both coasts. Because I was already in Portland, it was possible to rearrange some flights in order to participate in my great aunt’s funeral. 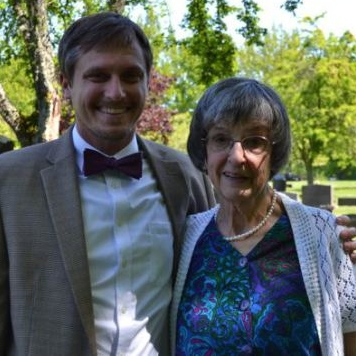 Aunt Corrine passed away last week and, in God’s providence, I got to be in Bellingham with family yesterday as we remembered a life very well lived. This morning, as my flight east reached altitude, I pulled out my laptop to catch up on email. There I found a prayer Michael had posted for me yesterday, for the funeral and the time with family. If this sounds odd then you probably don’t have a friend like Michael and, for your sake, I hope one day soon you will. I’m posting Michael’s entire prayer here and I hope you’ll drop by his blog to read more of this sort of thoughtful, kind, and true writing. He’d take a break from blogging for a while during a busy season but it seems that his public writing is back. This evening I’ll land in New Jersey and drive into the Bronx for dinner with a good friend. After spending a few days with prospective church planters in Connecticut I’ll drive to Harlem to preach at another friend’s young, multi-ethnic church with whom our church shares much in common. I thank God for these friends and for the family I spent time with yesterday. Some, like Michael live nearby but most don’t, so these times together are gifts. It’s probably around the time that Winston is standing near the casket of his aunt, saying things about her and saying things about you. Will you be with him in the midst of a long day of many feelings? While you know the joy that comes at the entrance of one of yours into bliss, you know the mixed feelings of grief and sorrow and pain as well. Will you accompany him in the fragile experience of all these emotions and grant him a strong sense of your nearness. You know the deep feelings of love, the memories, the jokes, the stories. Enable him to remember with truth and humor and affection. You know all the things that make us love animals, all the things that make us good and bad at loving. Redeem every moment that he’s spent, and that his relatives have spent, combining those times into full experiences that help them support each other now. You see those memories coming back when we see our loved ones, the remains of them, the last pictures of them. Give Winston and his family and their friends a host of things to see during this day. May they see you in the midst of their tears and their prayers and their songs and their presence. May you be in the midst, drawing them all into your embrace. Give them joy and praise and kindness. Let them eat well and restore each other through loving touches and long laughs. And when the days pass, after others have stopped mentioning their relative, after they themselves have forgotten or begun to forget their loved one, make every spontaneous memory that arrives unbidden an occasion for gratitude and peace and anticipation for that last family gathering. In the name of the One who conquered death. Amen.